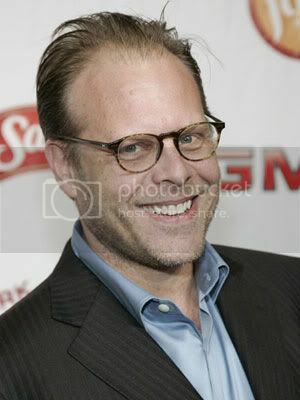 Alton Brown is a Geek God. Alton has all the passion that Tony has for food but he also has a very cool, scientific side that makes you not only understand how to make whatever it is your making but also why it turns out the way it does. Read through the recipe first, it's easy to follow. My advice in advance is if you don't have a candy thermometer on hand (and I didn't, I got mine for $2.00 at Walmart*) get one. I could see bad things happening to those that don't. For my chocolate I used Trader Joe's Non-Sweetened Baking Chocolate and had great results. The fudge was the perfect texture. Firm yet soft. A slightly grainy texture. It melts in your mouth. It's cool on the tongue. There's just a touch of vanilla. I never thought I could make fudge this good but Alton made it possible. Well worth the effort and I think my friends are going to love it. That sounds like a good recipe. I should try that sometime. Oh and I totally agree about him being a Geek God. I adore him.